The day I did this interview (May 15) was a special one for me, because it was my son Jack’s first birthday. Festivities over, I set out with Jack asleep in the papoose to find somebody to interview for this website. On one of the benches beside Athens Square Park I found Nancy Vinson talking with a group of friends. Nancy has lived in the neighborhood for almost 30 years. Our conversation was accompanied by the sound of children in the playground behind us, always so busy at weekends. Nancy worked in sales in the shoe department in Saks Fifth Avenue and is now retired. She’s happy to be retired after working for many years. But she enjoyed the job for the people that she met. Occasionally, a celebrity would come through the department – once she saw the actor Jackie Gleason. Usually though, they sent their personal shoppers who would try on the shoes in a special room and then send them off to a nearby hotel room or apartment. Nancy’s parents moved to New York from Puerto Rico and made their living working in factories. 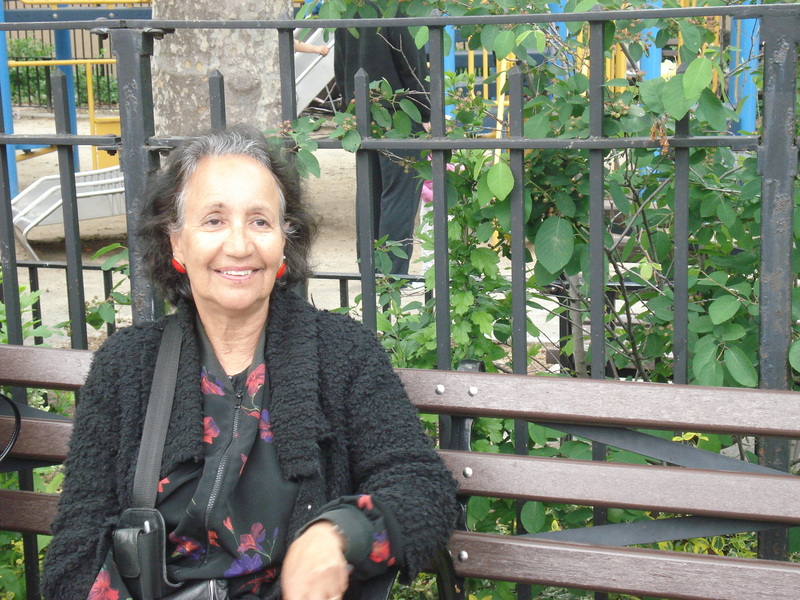 She had her own kids and brought them up in the Bronx, “many moons ago”, she says. When her kids had grown up and left home she moved to Astoria. “I wanted to get away from a neighborhood that didn’t feel safe to me. I told my mother I just can’t stay here. Nancy goes to a local senior center where there’s music, dancing and bingo, and she volunteers there as well. She goes to church nearby. She has always felt safe in Astoria. The main change has been the new businesses that have opened up, including Trade Fair supermarket opposite Athens Square Park, and many restaurants. Astoria has all that she needs. “You rarely need to get on the train to Manhattan. I hang out here,” she says. Melissa Rivera lives in one of the yellow brick railroad apartment buildings off 30th Avenue, west of Steinway. Most of the rooms in the apartment are put to uses you would expect: a kitchen, a living room, her six-year-old son Juan’s bedroom. Another, though, is the soapmaking room. Full of tubs, mixing machines, and bottles, that’s where she make soap in the evenings, after she finishes her day job working in child welfare in Manhattan. “I needed to create some space so I could make products. It’s hard if you keep your ingredients in one room and do your mixing and cooking in another room. So I figured it’s part of what you have to do, to make it happen.” Having given up her bedroom to have space for soapmaking, she sleeps wherever she falls asleep. Melissa’s mom was born to Puerto Rican-immigrant parents in the apartments that used to be where the Lincoln Center is now. When the Lincoln Center was built the family was re-housed in Queensbridge, where her mother spent the rest of her childhood. Her father came to New York from Puerto Rico. Melissa was born in Astoria, and has lived here for most of her life other than a spell in Manhattan. As a child she worked full-time outside of school in places along Steinway Street. Her first job was selling popcorn and tickets at the old movie theater, in the building which is is now New York Sports Club and Duane Reade. “Actually I was working there illegally at first because I was thirteen, and you can only get your working papers at fourteen,” she says. After college, Melissa got a job as a social worker in a girl’s group home. “I was lucky, I found my passion really quick,” she says. Now she does not work directly with the kids, but trains the staff who do. “It’s really about teaching them how to like teenagers. Teaching them how to work with them…Sometimes I miss working with the kids, but I’m aware I’m not as young as I used to be!” (She’s 39). Her current position and supportive boss also give her some flexibility to run her soap-making business alongside: Naturally Good Soaps. Melissa started becoming interested in green living in 2003. She began to research essential oils, realized she could use them to make her own products, and found her way into soapmaking. “The process of making soap is pretty cool,” she says. “I think like a baker, coming up with recipes, and wanting to experiment with new stuff.” She uses five main ingredients: olive oil, coconut oil, sweet almond oil, shea butter and cocoa butter. Those she mixes together with essential oils for the aroma, with herbs for the color, and with lye that kick-starts the process of “saponifying” – turning the ingredients into soap. Like in all industries, soapmakers like to have the best equipment to do their work. 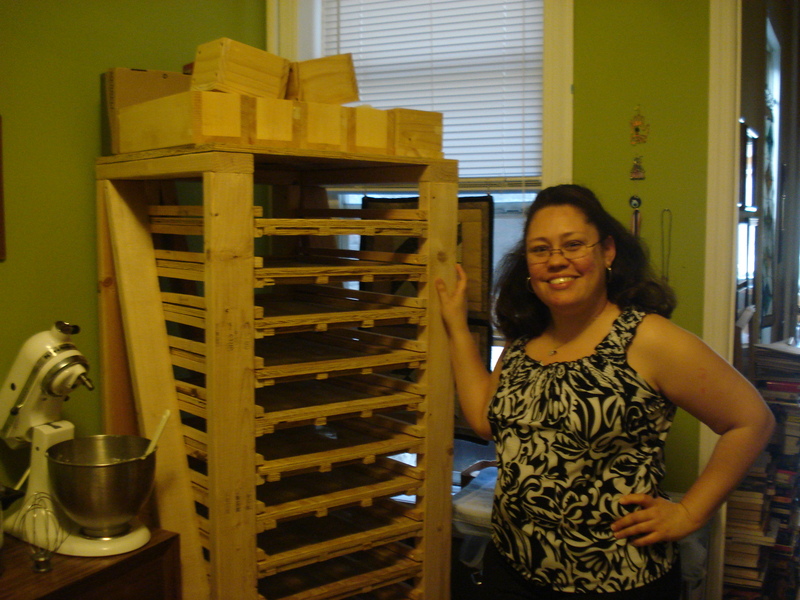 In her soap-room is a new wooden soap-drying wrack, made by a carpenter friend who had recently been made redundant. (Once in its mould, the soap takes four to six weeks to dry – Melissa used to dot them around the apartment on cookie wracks). She currently sells her soap products to friends, colleagues, people who follow her on social networking sites, as well as to one wholesale client, a wholefood store in Shelter Island. Melissa says that soapmakers are on the whole a friendly and supportive bunch. She knows others in New York, South Carolina, California, Ohio…with whom she shares ideas and advice. Most are women, though there are a few men. The men tend to be into the chemistry of soapmaking – and they tend to be married to a soapmaker! Melissa is clear about her goal for the future. 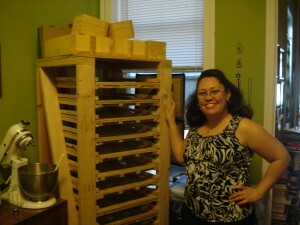 It combines her passions for Astoria, soap-making and social work. “I’m very clear that I don’t want a retail location. My dream is to have a nice little spot in Long Island City or Astoria right by the water – I love the water – where I can produce my stuff. No doubt some would leave inspired to set up small businesses of their own. Panayiotis Menikou is the President of EuroMarket (slogan “Fine European Foods). It is on 31st Street under the subway tracks, half a block south of the 30th Ave station. When he is not dealing with orders in his office he can often be seen outside the front of the store, talking with friends and neighbors as the trains rumble overhead. Panayiotis was born in northern Cyprus. He was fourteen when Turkey invaded the island in 1974. “They came from the North towards the South,” he says. “My father put us in a tractor and we drove south to save ourselves. “I told him I wanted to take the radio. I had our big radio all ready to go. He said ‘oh no, leave it here, you’re going to break it.’ We thought we would only leave for one day or two days and go back. Panayiotis worked hard through high school and then went into the army for compulsory military service. He was wondering what to do on leaving the army when some friends who had gone to study in the US encouraged him to join them. They helped him enroll in Queens College to learn English, and in 1980 he moved here. He later brought one of his brothers, and then the other brother, and then his sisters to the US to study as well. 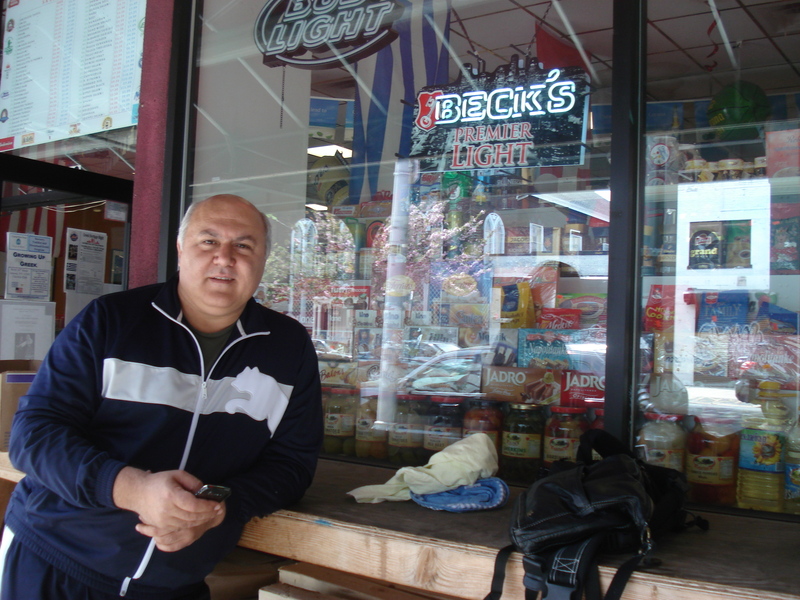 While he was studying, Panayiotis opened up “Cyprus Deli” on 30th Avenue. His siblings all returned to Cyprus at various points, but he stayed on. He had the idea for EuroMarket because a lot of his European customers started asking if he could stock products from their countries in the deli – he realized there was a need for a European supermarket in the neighborhood. One day he was walking down 31st Street and passed a pool hall that had been closed for two years: he decided that would be his location. 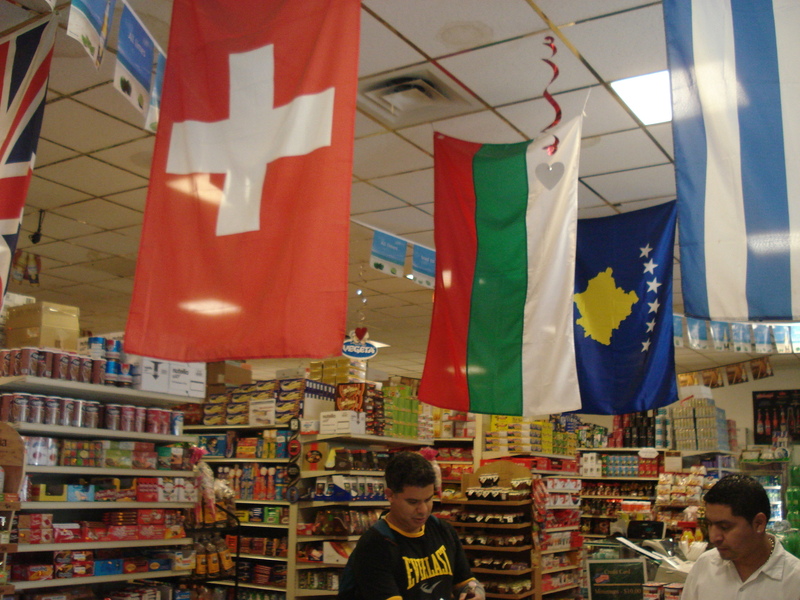 EuroMarket sells food from all over Eastern Europe: from Bosnia, Serbia, Montenegro, Croatia, Poland, and Greece…”Slowly-slowly we will sell everything!” Panayiotis says. It also stocks over sells over 700 varieties of beer. 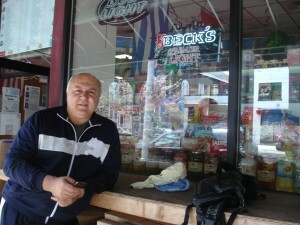 “Cyprus Deli became well-known for its beer. We were the first around here to stock the German and Belgian beers. So when I started this store, I thought we must keep selling beers from all over the world.” His own favorite is Duvel from Belgium for its strong, full flavor. Panayiotis says it was hard getting the business going at the beginning. Its location just off 30th Avenue means that people do not stumble across it – they have to know it is there. But things are getting better now: he has more and more products, more and more customers. The “green line” between the north and south of the island was opened in 2003 so residents from either side can now cross over. “My brothers went to see my house. But I didn’t go. I don’t feel like going. You know, there are Turkish people living inside your house, and you have to ask for permission to go. This is ridiculous. We have a lot of land there that today would be worth a lot of money. It’s near Famagusta, one of the best beaches. 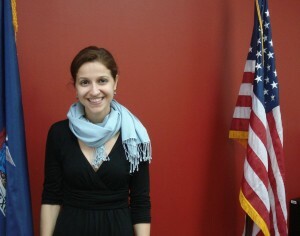 Aravella Simotas, 32, is the New York State Assemblymember for district 36. Her district covers all of Astoria (30th Ave included) and some of Long Island City. Simotas came to Astoria with her parents from Greece when she was six months old. She has been involved in community work here since high school, and when the seat became available in 2010 she was a natural candidate. Not that she had established it as a career goal. “Albany seats in New York City are like a cheap one-bedroom on the Upper East Side. It doesn’t happen! Or if it does happen, it doesn’t happen often at all,” she says. But last year the senator who represented Astoria and its neighboring districts like Woodside and Ravenswood – George Onorato – retired. District 36 Assemblymember Michael Gianaris ran for and got the New York State Senate seat, leaving his former Assembly seat open. 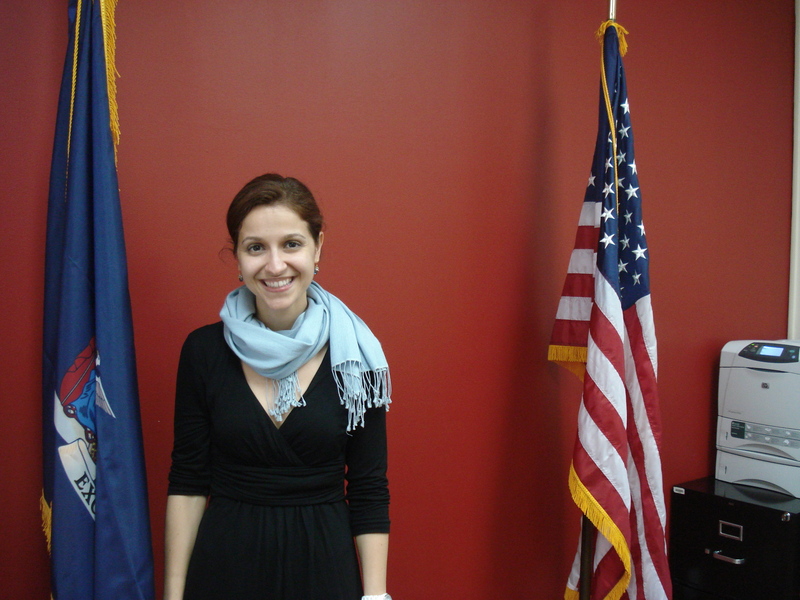 Simotas is the first Greek-American woman in the Assembly. Her own story is an example of this. Her parents arrived from Greece “with two suitcases in their hands”. Their family (the parents, Aravella and her brother) lived in a one-bedroom apartment. Simotas’ father worked in a delicatessen, then bought the delicatessen, and eventually bought his own home in the neighborhood. Simotas went to elementary school at PS17 on 30th Ave. Then she attended Junior High School 126 and William C. Bryant High School, both also in Astoria. She also took classes at St. Demetrios, the largest Greek-American school in the US, which is two blocks below the 30th Ave subway station. “My parents always instilled in me that you should know your culture and your roots. So five days a week after normal school I went to Greek school! That’s what a lot of children of Greek immigrant parents did. And they still do. Even the second generation. While in college at Fordham University Simotas worked with New York City Council, in their Office of Oversight and Investigations. She examined issues like how the MTA was spending taxpayers’ money, and the sale of lottery tickets to underage minors. It gave her a taste of how government can change things. Then while at Fordham Law School she served as the local district representative for former city council member Peter Vallone Senior, and went on to run his son’s campaign in 2001. After leaving law school, she worked for a while in the federal court system before becoming a commercial litigator – all the while remaining a member of Queens Community Planning Board 1 and serving on other local boards. Simotas says she faces two particular challenges as a New York State Assemblymember. She’s new, in an institution in which many hold their seats for years and years. And she’s a woman – currently only 23% of the legislature (i.e. Senate and Assembly) are women. The gender in-balance has a lot to do with the tough schedule, Simotas says. From January through June she has to be in Albany for three days a week – four in March during the budget period. Then for the remaining days, including the weekends, she’s working in Astoria and attending community events. Her working days often extend to two or three in the morning. Simotas has been married for six years, and while she does not yet have children, she hopes to someday, and to find a way to strike that balance. Simotas says her colleagues’ advice has been a crucial help so far, in navigating the Assembly and in managing to get her first bill through within 12 weeks of having started work (a change to civil law that cuts red tape for litigants who want to discontinue their lawsuit). “The leadership in the Assembly, and particularly the women, have been so generous with their time and sharing their institutional knowledge. You would think there might be some kind of rivalry but absolutely not. I haven’t felt it at all.” She also receives advice from Senator Gianaris (her predecessor), whom she considers her mentor. One of Simotas’ big causes is Astoria’s small businesses. “They are the backbone of our local economy,” she says. “They employ many of our residents and they add so much revenue to New York State.” She’s all the more motivated to support them by the fact that her parents are former small business owners. Yet they face a lot of challenges. To give an example, Astoria’s many restaurants and cafés are often slapped with fines by the health department for not complying with new regulations that have been drawn up just the day before. The fine ended up costing the owner an additional $10,000. He bought the refrigerator from the first vendor he could find because he was worried about complying as soon as possible, and also had to pay to get alterations made in the restaurant to get it installed. She has written a bill that would prevent the Department of Health from enforcing a new regulation for 60 days, and would also give the businesses written notice of new regulations. Another important issue for Simotas is protecting tenants. “There are a lot of tenants here, and many things have happened in the past few years that are not fair to them.” The law is currently biased towards landlords and she wants to help change that. One of the first bills Simotas authored was to ban toxic toys in daycare centers. While she was campaigning last summer she visited a daycare center and noticed that while half the markers the kids were using were labeled “non-toxic”, the other half were not. She says she was surprised that there wasn’t already a law preventing daycare centers from using toxic toys. The camaraderie with other Assemblymembers, and setting herself clear goals to get bills passed are two aspects of Simotas’ job that she most enjoys. Not surprisingly, Simotas has found productive ways to use that time too. She listens to books on tape. She has set up hands-free calling in her car so that she can take calls. And she records her notes and listens back to them during the drive. As well as working the system to get bills passed, Simotas is also working to change how the system in Albany works. She’s a member of the committee that steers the direction of the Assembly and proposes reforms, and says it was a real honor as a freshman to be put on that committee.